Antari S-100X Snow Machine. "The Antari S-100X now with a newly-developed PCB and new advanced pump, can be even more reliable and generate up to 50% more snow output than its predecessor (S-100). The S-100X can create both a romantic snow and astonishing blizzard effects." 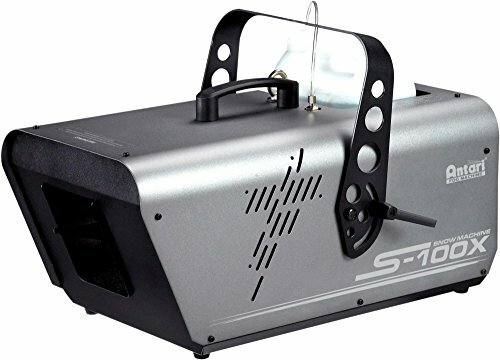 "Power: AC120V / 60Hz Power Consumption: 900 W (Min Output) , 1150 W (Max Output) Output : 200 ml / min Tank Capacity: 5 liter Accessories Included: Hanging Bracket Remote Included: SC-2 Volume Remote Weight: 11.0 Kg Dimensions (mm): L 505 W 276 H 280 DMX: On board"
"Power Consumption: 9 W (Min Output) , 115 W (Max Output)"